> Furthermore, according to the US Congressional Record of the 110th Congress (2007-08), Craig Peters Osth has been listed among the nominees to be “Consular Officers and Secretaries in the Diplomatic Service of the United States of America”. It is mentioned he hails from Virginia. > A search result showed there is only one individual named ‘Craig P. Osth’ who is resident of 11641 Charter Oak Ct, Apartment 30, Reston,VA-20190. 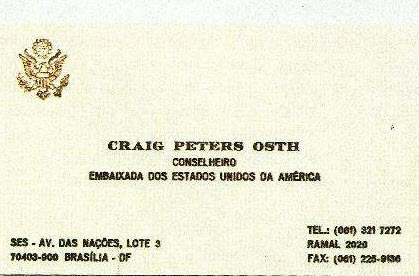 Source Sends – Craig Peters Osth was listed as the U.S Embassy Regional Affairs officer in Bogota, Columbia in 2004. He may have been the CIA Chief of Station. Source Sends – Craig Peters Osth was also stationed in Naples and Rome, Italy in 2010. Son of Robert Edward OSTH who died in 2008. Mother is Elizabeth (HOLMES) OSTH. Older sister is Jaquelin (OSTH) NUILA. Brother is Robert Powers OSTH. OSTH appears to have grown up in Berryville, Virginia, born into a family with hawkish views against the perceived enemies of his country (http://www.unz.org/Pub/AmMercury-1959dec-00136). His mother (aka Betsy OSTH), according to a FOIA release: https://www.google.ca/url?sa=t&rct=j&q=&esrc=s&source=web&cd=11&cad=rja&ved=0CCgQFjAAOAo&url=http%3A%2F%2Farchive.org%2Fstream%2Ffoia_JBS-Richmond-1%2FJBS-Richmond-1_djvu.txt&ei=vuSWUqG3JpLboAT9xoDoDQ&usg=AFQjCNGzB_VBT83TweC11VoJl4tzwEkWnw , edited an anti-communist publication called “Minute Women USA” during the 50’s-60’s era of McCarthyism (http://en.wikipedia.org/wiki/Minute_Women_of_the_U.S.A.) and also broadcasted a similarly themed radio program (http://news.google.com/newspapers?nid=1314&dat=19670610&id=A-xXAAAAIBAJ&sjid=4ugDAAAAIBAJ&pg=7436,3769144). Considering his father’s military background and his mothers apparent political activity, it is not surprising OSTH entered the military after graduating from Hampden-Sydney College in 1973. Her children have followed the family tradition and also entered the Armed Forces. Son Sean is a Lt. Cmdr. in Norfold, VA and is in a relationship with a Colombian woman. So who is Robert Carnegie? I wonder what Mama Betsy thinks of this considering Hollywood’s ties to the big red menace?